Here we are providing you updated and most relevant Study notes of on Tort of General Defenses for Law Entrance Exam. These study notes are highly recommendable for all those who aspire to crack CLAT, DULLB, AILET and other Law Entrance Exam. The wrong doer is liable for the wrong committed by him however there are certain general principles or defenses which apply throughout the law of Tort apart from particular defenses which apply to a particular Tort as they have been discussed under the particular branch of Tort. Voluntarily acceptance of injury is not fit for action in Torts. It means that a person who consents to an act being done or who takes upon himself the risk of suffering damage cannot bring on action in respect of that act or damage. No action lies against the injury suffered voluntarily as no man can enforce a right which he has voluntarily waived or abandoned. The consent may be express or implied. (b) A patient gave consent for surgery, later he can’t sue the surgeon for doing the operation. (c) If ‘A’ cries for help and ‘B’ voluntarily tries to help him and if person ‘B’ gets injured, later he can’t sue ‘A’. (d) A spectator in a cricket match got injured by the ball. He gave his implied consent and voluntarily sat in the stadium. (e) A videographer gets injured while shooting a racing car as the car goes off the track accidentally; the car driver is not liable. In the defence of Volenti non fit Injuria mere knowledge of the risk does not form consent. Explanation: Volenti Non Fit Injuria is different from Scienti non fit Injuria. Scienti means knowledge and volenti means voluntarily, meaning thereby mere knowledge of the risk does not form consent. Defendant can get benefit in case of Volenti Non Fit Injuria only not in Scienti non fit Injuria. There must be free consent. It should not be taken by fraud, misrepresentation, mistake, coercion and undue influence. Case Law : Smith V. Charles Baker & Sons. Smith was employed with Charles Bakers. One day smith was working on a drilling machine and on the top of which a crane often jibbed. It was a normal practice that the stones were jibbed over his head. One day a stone from the crane fell down and injured smith. House of Lords held that smith had knowledge but not consented to undertake the risk of being hurt, there was negligence on the part of Charles baker & sons i.e. Respondent and respondents were held liable. The plaintiff was a spectator at a motorcar race. Due to a collision between two racing cars, one of it rammed in to the spectator’s stand and injured the plaintiff. Held the organizers were not liable, as the plaintiff impliedly took the risk of such injury. When the plaintiff voluntarily undertakes a risk to rescue somebody from an imminent danger, created by the wrongful act of the defendant, the defendant cannot set up the defence of ‘Volenti non fit injuria’ against the plaintiff. In Haynes V. Harwood, the defendant left a horse carriage outside a building, absolutely unattended. Some urchins playing nearby threw stones at the horse. The horse unbridled itself and started running amok. This frightened the passer bys and everybody started running. A police constable, who was on duty in a nearby police station, decided to take charge of the situation and succeeded in stopping the horse. In the process of doing so, he sustained injuries and claimed damages from the defendant. The defendant was held liable and was prevented from setting up the defence of Volenti non-fit injuria. The defendant can effectively set up the defence that the plaintiff is the wrongdoer, provided some unlawful act or conduct on the part of the plaintiff is connected with the harm suffered by him. However, the mere fact that the plaintiff is a wrongdoer does not disentitle him from recovering from the defendant for latter’s wrongful act. If a trespasser enters the owner’s premises, the owner cannot inflict unnecessary harm on him by saying that the plaintiff is the wrongdoer. The defendant had set up spring gun in his garden, with a view to protect the garden. The spring gun injured the plaintiff, a trespasser who came in to the defendant’s land. Held, the defendant could not set up the defense, as he had failed to put up a notice about the spring gun and also, it resulted in excessive harm. If the plaintiff has an unexpected injury owing to an unforeseen and inevitable event in spite of reasonable care on the part of the defendant, it is called inevitable accident. The defendant has to prove that he neither intended to injure the plaintiff nor had the means to avoid the injury by taking reasonable care. One of the members of a shooting party accidentally shot at another member, mistaking his movement for that of an animal. It was held that the injury was an accident. Act of God refers to some natural calamity such as heavy rainfall, storms, tempests, and volcanic eruptions. (b) The occurrence must be extraordinary and not the one which could have been anticipated. (c) It must be beyond the control of human kind. The defendant was owner of an estate containing lakes of ornamental water fed by natural stream passing through the estate. A very heavy rainfall caused the lakes to over flow their banks, floods the rivers and carry away four bridges. The plaintiff claimed compensation for the loss. The court decided that over flow of lake was due to Act of God (Vis Major). One can protect one’s person or property by using reasonable force. However, the use of force is justified only for the purpose of defence and in the process of self-defence, if any harm is caused, the defendant is not liable. Note: 1) There should be imminent threat to personal safety or property. 2) The force used should not be excessive. ‘A’ threw a lighted firecracker aimlessly in a crowded market place. It was about to land on a sweet stall. The owner of the shop, acting in self-defence quickly picked it and threw it. It fell on the plaintiff. Held that the sweet stall owner had acted in private defence and hence not liable. Which of the following is not a general defence? Rama calls Suresh home for dinner. She then sues him for trespass will she succeed? A gives B, a doctor her consent for an operation. She sues him later for performing the surgery. Will A succeed in an action against B? Shyam went to watch a cricket match. The ball hit and he was injured. Can the defence of Volentinonfit injuria used? Ram saw that two horses ran away and were causing a lot of traffic inconvenience. He tried to stop the horses but got hurt in the process. Would he be able to claim damages from the owner of the horses? In cases where the plaintiff is the wrongdoer can the harmcausedbe excessive in nature? If Ramu shoots Rani for trespassing onto his land. Can he claim that she was the wrongdoer? If Usha had a notice saying that she has sensor automated water sprinklers in her garden and despite seeing this Harsh enters her garden. Can Usha claim the defence ofplaintiffthe wrongdoer? P and Q were out hunting. P shot Q mistaking his movement for an animal. Will P be held liable? When two dogs were fighting one of their owners in a struggle to stop the dogs throws a stick at them which hits the other owner. Will he be held liable? Which of the following principles should be fulfilled in order topleadthe defence of Act of God? If the owner of an estateis suedas the flooding of a natural stream passing through his estate damages four bridges. The flooding was due to rainfall. Will the owner be liable? Can Right to private defence be excessive? 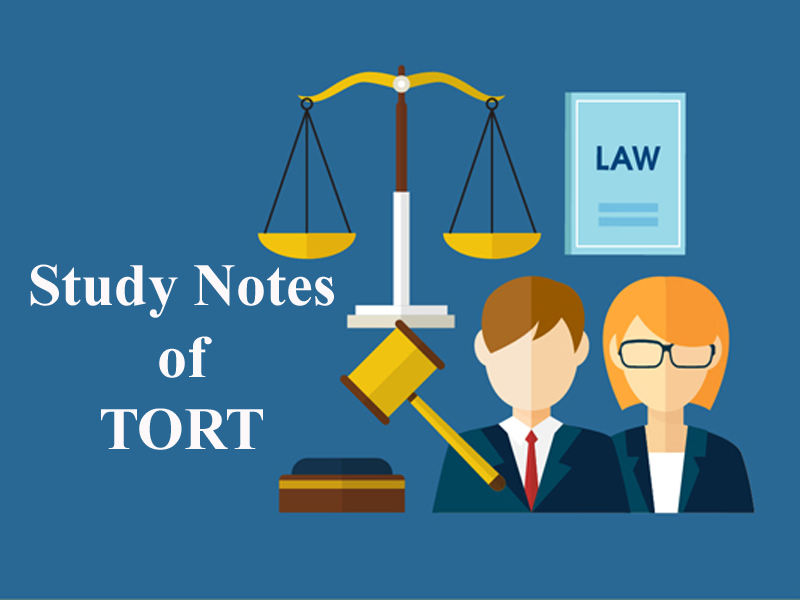 Get the updated and most relevant study notes on Tort for upcoming CLAT and other Law Entrance Examination AILET, DU LLB and IPU etc.